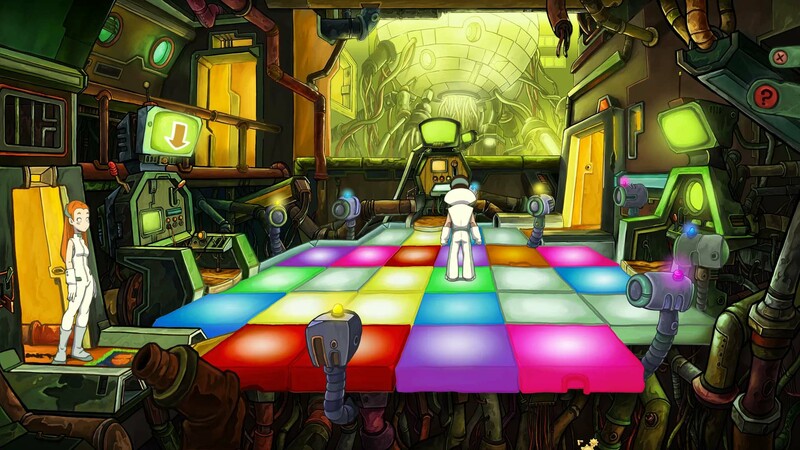 Goodbye Deponia is the last instalment in Daedalic Entertainment’s Deponia Trilogy, finishing the story of Rufus, Goal and the doom of the junk world Deponia. Goodbye Deponia picks up right after the events of its predecessor, with Rufus, Doc, Goal and Bozo on their roller car. 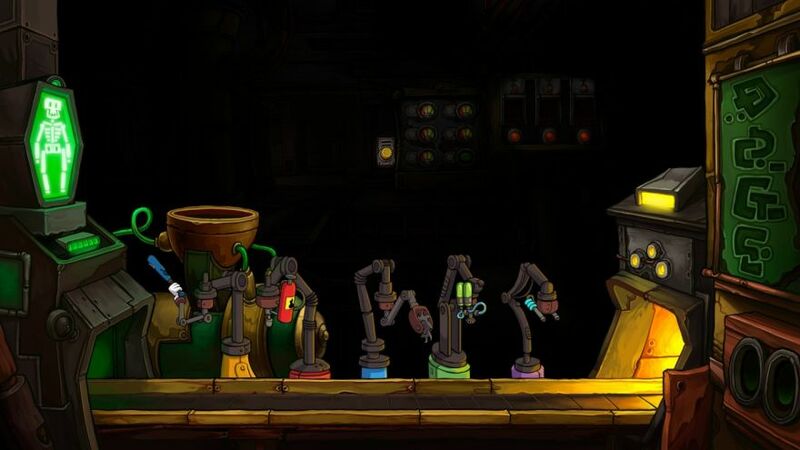 Things seem to be going smoothly until Rufus messes things up and causes the roller to be destroyed, forcing the team into hiding while trying to stop the destruction of Deponia. From the start, this game showed me its greatest flaw: characterization. In the past two games Rufus has always been selfish and self-absorbed and both a genius and a klutz, and it was disappointing to see that two outings hadn’t been enough to make him mature or change a little bit. Rufus is extremely unlikeable as a protagonist and makes it difficult for the audience to give a damn about his antics. Most of the secondary characters remain the same as they’ve always been, and while there are a handful of characters that do change, the game makes a point out of destroying their lives so they revert to type. 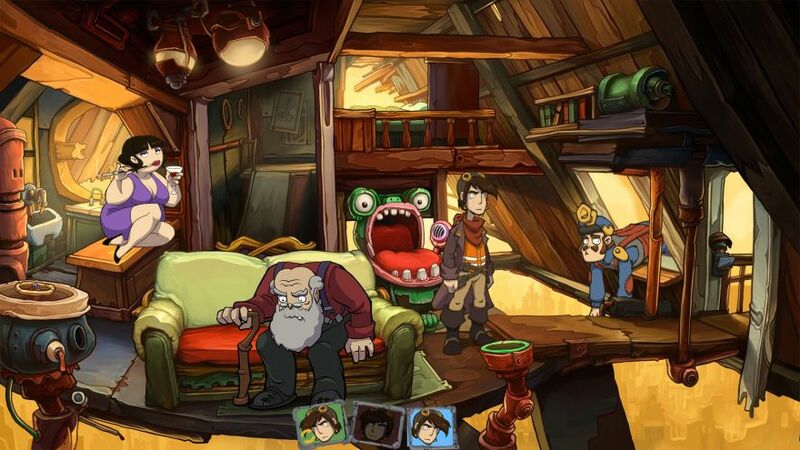 By the end, I just wanted all of Deponia, including these flat characters, to die a horribly slow death. I was offended that they decided to dismiss Rufus’ asinine behaviour with this cop-out excuse: he’s a clone and programmed not to care about anyone’s life. It’s lazy writing. The plot is a convoluted mess. Every title in the series has gotten close to having Rufus and Goal reach Elysium, only to have something happen at the last minute, which derails the plans, and Goodbye Deponia does it again, giving me the impression that the plot was artificially inflated just to extend game-time. It’s even more apparent when the logic and argument behind the roundabout are so weak. Another proof of extended plot is the fact that at one point you control three Rufus clones, each with their own missions and puzzles that make the game feel bloated. The writing and humour themselves are much hit and miss. There are very funny references and Rufus’ “We are Asses” speech near the end is fantastic, but in most cases the jokes are downright offensive, coming off racist and sexist at best. It’s made even more disgusting by what I previously mentioned: you are forced to wreck other people’s lives to make progress. There’s a sequence involving a Monkey and a Grinder that is very offensive. I am not politically correct, but there’s offensive-funny and Deponia misses the mark on that and goes straight for simply offensive. The Bozo family house has a built in laugh track and some atrocious writing! The gameplay is standard point & click adventuring, with puzzles coming in two varieties: inventory based and ingenuity puzzles. Inventory based puzzles are very annoying and often require obscure and frankly obtuse leaps of logic to which “Moon Logic” doesn’t even apply anymore; Mars logic is more apt. You have to combine almost random items with each other in order to progress. The randomness is the most apparent with the spiced-up pie you serve Bozo, an old vending machine with toothpaste, dust, pepper and other nonsense put on top. It doesn’t make much sense, but you get through it just by trial and error. Ingenuity Puzzles are the real gem in this game as they take a step back from the convoluted logic-leaps and just have you use your wits. From a Disco-themed puzzle in which you need to keep cameras from seeing Goal to a tapeworm removal surgery puzzle. They’re a much-needed break from the moon logic madness that plagues the game and I’m sad there weren’t more of these puzzles. This puzzle was very fun and creative! Sound-wise, it has good voice acting and the hobo-singer between acts remains the best of the series. Background music however, tends to get a bit repetitive, especially in areas with plenty of backtracking. My biggest gripe however, comes with Cowboy Dodo, and annoying new character, which has a couple of appalling musical parts. 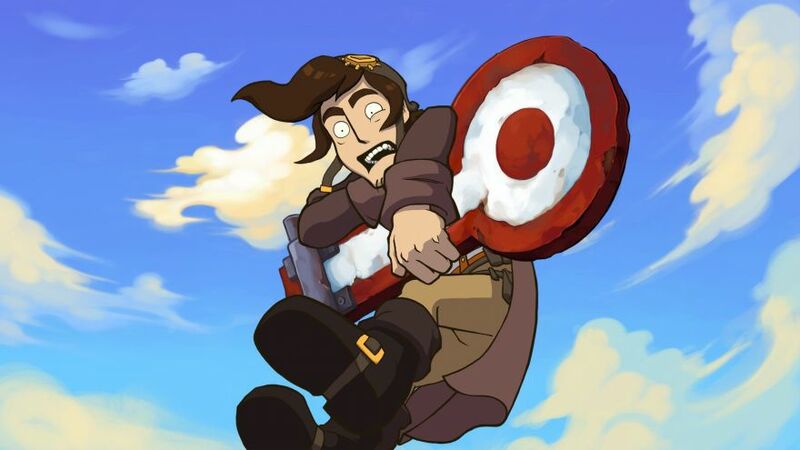 Deponia has always been charming in its derelict kind of way and with its cartoonish visuals and the third installment brings more of that bizarre and goofy goodness. Environments look shabby and downright uncomfortable but they work for Deponians. Items are easily identifiable and character animation is very good. I do have mixed feelings with the animated cutscenes though. Some of them look very good but others, especially those with plenty of ‘action’ look like cheap flash animations. Some cutscenes look really well! In the end, Goodbye Deponia closes the trilogy with a bittersweet leaning towards sad conclusion that would’ve worked even better if they’d taken the proper care to polish their plot and characters. As it stands however, I can’t say I’ll miss it and after playing Memoria, Goodbye Deponia seems to be a step back for Daedalic. The Mental Attic Score: Wait for a Sale. If you can, get the game in a bundle with the other two, so you can play them straight, if you dare.